Made the bar horizontal bars so that the labels are easier to read. I also find it easier to compare the length of the bars on horizontal bar charts, but that's a personal preference. 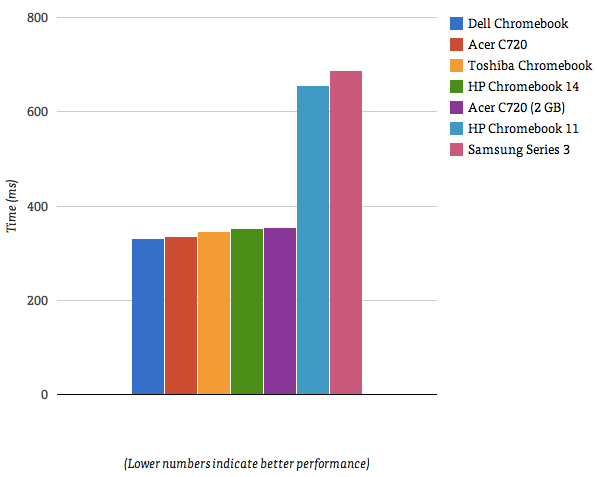 Added a metric to show how much slower the other Chromebooks are compared to Wirecutter's recommendation (Dell Chromebook) and colored the bars by the % difference. 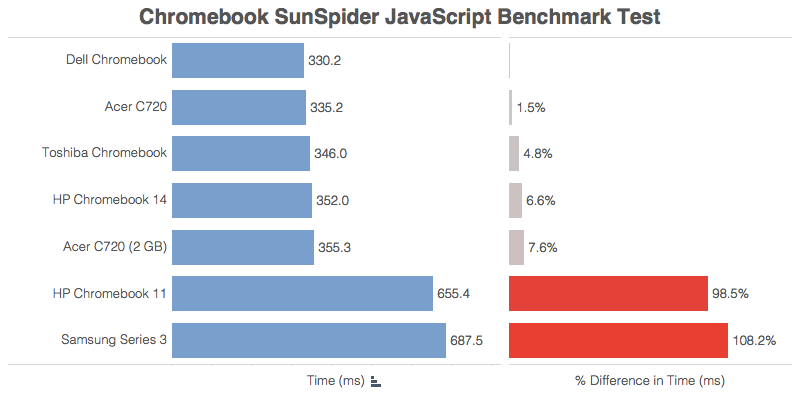 This helps provide more context to the speed comparisons and I don't have to do the math in my head. Love the Monday Makeovers! Question about your take on labels at the end of bars. In this case, each label has the same number of characters so this point may be moot. But I've read arguments in the past that the labels can lead one to misinterpret the length of the bar when viewing at a glance. Therefore, when possible, labels on the bars would be preferred. A little picky but would love your take on that. The labels should ALWAYS have the same precision. Putting them inside the end of the bar works as well. I'm indifferent to it. Good tip! I've always been a proponent and fan of using horizontal bars instead of vertical for this main reason of having each bar individually labeled instead of relying on a multi-color legend. Good feedback Steve. Including that in the title would probably be best. I imply that by the % difference in speed, but I can see where that could be misinterpreted too. Thanks for the feedback!